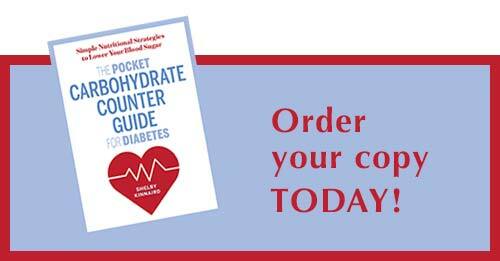 Are you suffering from zucchini overload? It is that time of the summer. 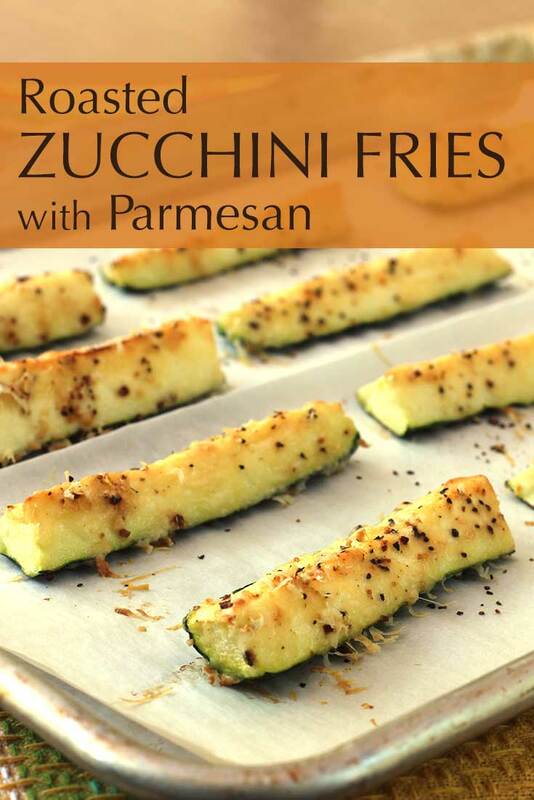 Here’s one more recipe to add to your repertoire – Roasted Zucchini Fries with Parmesan. The Grillmaster celebrated his birthday a few days ago by doing what? Grilling, of course! We served the requisite burgers and dogs, Grilled Watermelon Gazpacho, corn on the cob, and these roasted zucchini fries. The zucchini was the only thing he didn’t grill. I’ve tried zucchini cooked in a similar way, but sliced in rounds instead of sticks. The rounds got a bit too soggy for my taste. This triangular shape seems to get more crisp. Both the zucchini-loving nephew and the zucchini-hating nephew enjoyed these fries. They agreed the Parmesan made a huge difference. The 5-year-old niece wouldn’t go near the zucchini. But, then again, she had loudly announced she didn’t like ANYthing we were having. I think she was just grumpy because I wouldn’t make her a smoothie. Trim ends of zucchini, then cut each in half lengthwise. Cut each half in half lengthwise. You should have 8 long pieces. Cut each piece in half crosswise to get 16 shorter triangular-shaped pieces. Place egg in a shallow bowl large enough for dipping the zucchini pieces. 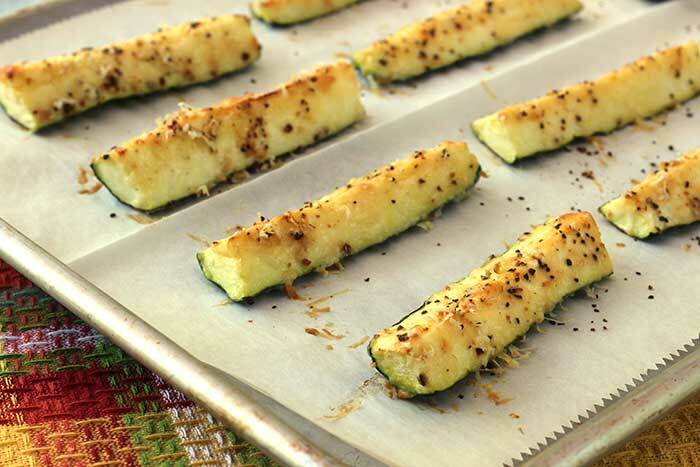 Combine Parmesan and garlic pepper in a second shallow bowl large enough for dipping the zucchini pieces. Dip cut sides of zucchini strips first into the egg, then into the Parmesan mixture. Place on baking sheet skin side down. Repeat with remaining zucchini. Drizzle zucchini with olive oil and roast until golden, 15 to 20 minutes.